While you finalize the attire and accessories for the bride, don't forget to chalk out your own look for each and every function. After all, it's not just the bride or the groom, even the bridesmaids are stars at the wedding. * Chandbali earrings: This semi-circular, crescent-shaped heavy earring is the accessory of the season and could go with almost all kinds of outfits. 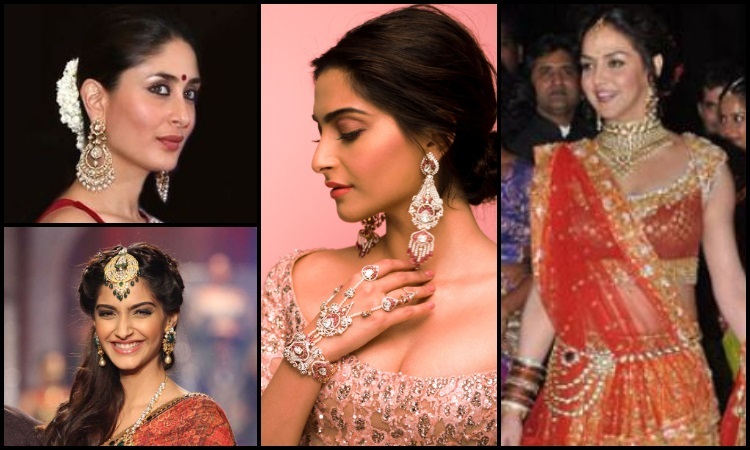 So when you are in a spot to choose the best earring that matches your attire for the wedding, chandbalis could be your savior. * Waistbands: This piece of jewelry can glamorize the simplest of attires. Waistbands are metallic chains, single or layered; embellished with dainty diamond or colored gemstone chains. They also come in various motifs like floral or coral. Adding a layered waistband to a plain pastel colored sari would be a classic look for a sangeet ceremony. * Mangtikas: Mangtika has proven to be a timeless and classic ornament for Indian weddings. There is a wide variety to choose from when it comes to mangtikas depending on one's outfit such as oversized ones, small pendant ones, jhoomar or the side-swept style. * Haathphool: Haathphool has lately become ladies' favorite. It gives a royal look.